Professor of Energy Engineering, Professor Abdulnaser Sayma leads a team which has produced a state-of-the-art concentrated solar power system (CSP) coupled to micro-gas turbines (MGTs) to generate electricity. 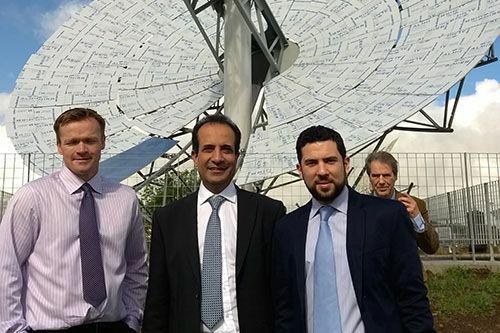 Professor Abdulnaser Sayma and his team of City University London researchers have achieved a major milestone for their solar dish power generation system. This project, the Optimised Microturbine Solar Power system (OMSoP) initiated and led by Professor Sayma, is co-funded by the European Union’s 7th Framework Programme for Research and Development. It is aimed at providing and demonstrating technical solutions for the use of state-of-the-art concentrated solar power system (CSP) coupled to micro-gas turbines (MGT) to produce electricity. The intended system is expected to be modular, producing electricity in the range of 3-10 kW. The micro-gas turbine (MGT) was installed in late April. In early 2016 it is expected to generate 6 Kw of electricity. Assisted by the European Turbine Network (ETN), City provides coordination and management of the project. The OMSoP project began in 2013 with 8 partners from 5 countries with a total budget of €5.8m. The Brussels-based ETN is a non-profit association which consolidates the entire value chain of Europe's gas turbine technology community. It facilitates gas turbine research and technology development, promoting environmentally friendly, stationary gas turbine technology, with reliable and low-cost operation. “We are elated with our progress so far and we have demonstrated that we are on course to achieve our objectives in terms of our target capacity for generating electricity. Our research represents a considerable advance in the possibilities for clean, reliable and sustainable energy solutions”. MicroTurbines are small electricity generators that burn gaseous and liquid fuels to create high-speed rotation that turns an electrical generator.